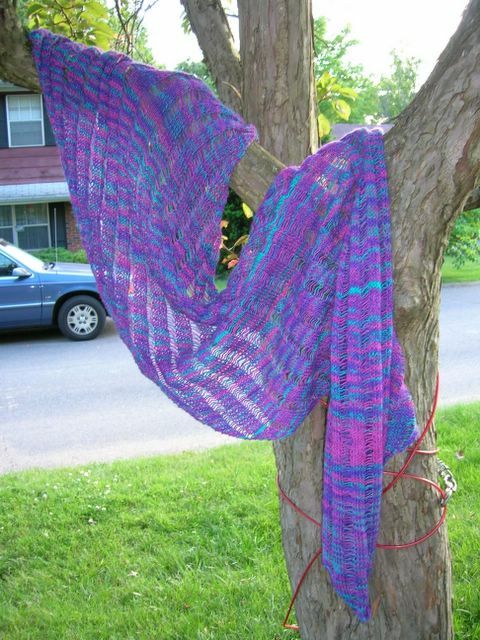 In other words, La Clapotis is finished. I liked the shimmer yarn (Knitpicks; Stained Glass Colorway) The finished product is SO VERY SOFT. Huggable. Not much pooling of color at all -- only one area of pink that is visible in the top picture. Doubling the yarn must prevent a lot of the pooling. I should mention that I used about 1340 yards of shimmer -- this is, of course, about 20 yards more than three skeins. I might have made it in three, except for the dreaded knotting incident, which was solved by removing the knots with scissors. I actually didn't sacrifice too much yarn, so I don't know (???). Three skeins or four? I used US size 8 needles. 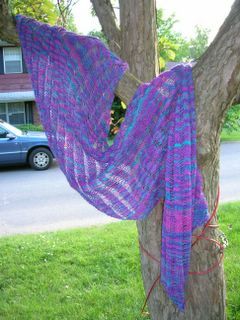 Finished clapotis. Note one area of pink pooling. I am on the decrease section of the clapotis. She is almost done. 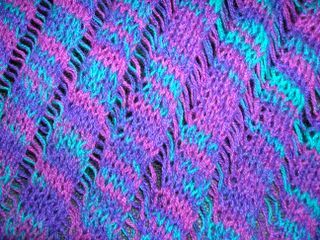 Each row that I knit is one stitch shorter than the last, because each row now has a decrease at the end. AND when I drop stitches, I get to drop two rows of stitches at a time. ALMOST DONE. I've included two photos. One is clapotis in my husband's desk chair -- not that great, but I wanted a dark background on which to spread her out. The second is a stitch detail photo. I'll take another photo when she is done -- maybe outside in nice light, although the color is pretty true in these photos. 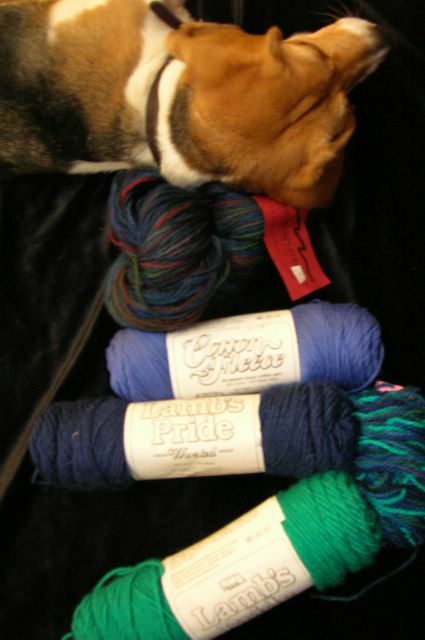 I went to Knit-n-Hook today -- our local yarn shop -- and had some fun. I bought a skein of Brown Sheep Cotton Fleece in columbine blossom -- a nice blue (which isn't listed on their site -- discontinued? 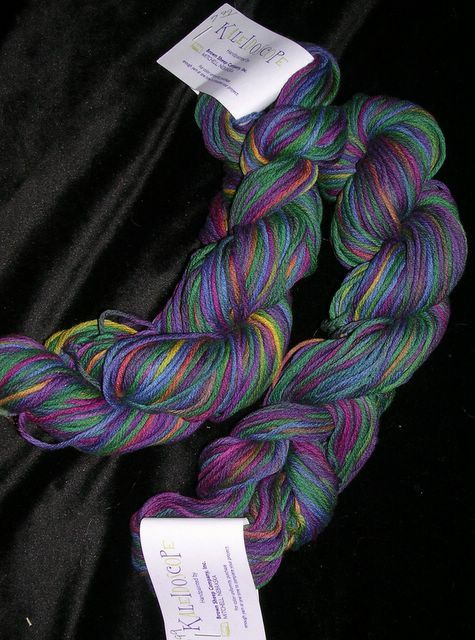 ), to match this yarn that I had in my stash -- also a Brown Sheep Cotton Fleece. I'm going to be brave and try to make socks out of this yarn. Wonder if it will work. I ordered two books from Amazon a week or so ago -- Weekend Knitting and At Knit's End: Meditations for Women Who Knit Too Much. This second book is written by Stephanie Pearl-McPhee, who is the Yarn Harlot. I'm saving both of them for vacation. I did peak in the Weekend Knitting book and found a pattern for a knitted bag. I had leftover yarn from the felted purse that I made with Miss Priss yarn, so I bought some Brown Sheep Lamb's Pride wool to match -- in Emerald Fantasy and Blue Flannel -- stripes for the bag. Both of these projects will be for vacation travel (Yippee!). I also bought a skien of Mountain Colors Wool quarters in Missouri River Blue. I have no idea what to do with this. A very fun shopping trip! Molly and my yarn from my shopping spree. Thought I might try using the squiggle for a scarf to wear to church on Pentecost. I’ve tried carrying it with a thin, plain red yarn (I don’t want to dilute the “redness” of the squiggle), and I’ve tried knitting with it alone. Nothing has pleased me. Back in the stash it goes – I’ll try again later. 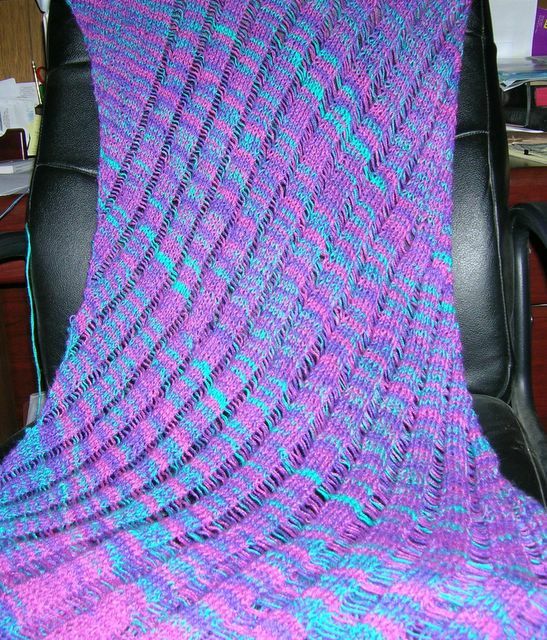 While Shimmer awaits winding (I did finally get the tangles out of the yarn), I have been working on two other WIPs. I finished (yippee) the diamond block scarf from the Vogue Knitting Scarves book. It turned out nice. 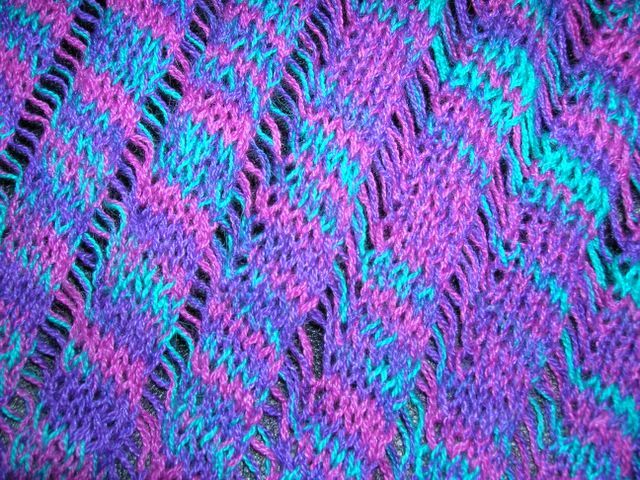 It took three skeins of alpaca -- I used a blue American alpaca yarn; 110 yards (1.75 oz). I’m thinking that it would make a nice table runner, so once I block it, I may try it out on the dining room table (who knows?). I’ve also made some progress on the socks that are pictured earlier in this blog. I may actually finish the second one of the pair. 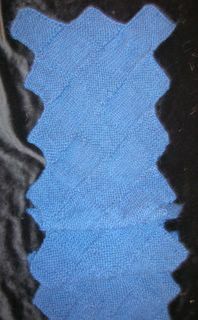 Diamond alpaca scarf, folded. Only one end is visible.